I need a lot of prodding. I am a quintessential stick in the mud, married to a man who wants us to see the world together. He's the dragger. I'm the draggee. Above I am posing in a purple scarf, purchased from a market day kiosk in France. Below I'm in China, looking forward to dumplings for dinner. In my new (thanks again Nan) blog, I'll offer my take on Paris, Pompeii, Tibet and Turkey, as well as my life as an ex- Bronx teacher and current scribbler. 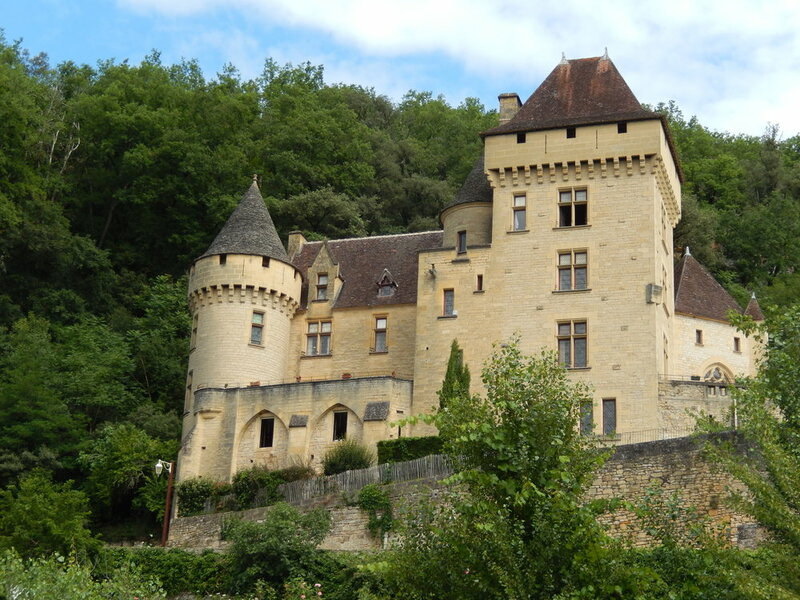 We've just returned from the Perigord, a region in southwest France where foie gras rules and castles abound. I'm a few chapters into a romance novel set in a haunted chateau. Working title: Haunted by Happiness. Start with an Irish American girl, add an impoverished French count, insert them in the picture below, and voila! Writing had always been what I loved, but who had time, as a teacher, as a mom, as a wife? How to start? What to write about? What have I learned? I once read that if we could see into another person's life, then we would forgive them. Certainly not an original insight, but one which resonates with me. But I don't write to preach. I write to release something unknown that bubbles up from within. Whether wounded or joyful, frightened or furious, I send forth torrents of words, the dam broken, from the place where writing starts. The beginning is like hearing another voice in my head. Driving, folding laundry, doing all the ordinary physical things that have to get done, words come to me. Eventually images follow, and I sit down to write. Fear not! I am not certifiable, and I haven't spent much time thinking about Joan of Arc, despite my French vacation. But words arrive, unbidden, sometimes in the form of song lyrics, or lines of the poetry I used to teach, or something someone once said. And characters begin to live in my imagination. I'd like to say that my writing is uncommon clever, literate, engaging, and so forth, and so I will! I write about women who are both smart and stupid, and the men who complement them. Most unique and individual is a little bite in my voice, inviting you to join me in a shared joke about my characters and about myself.